Adult Education Services at the Ford Resource and Engagement Center: Funded by Ford Motor Fund, SER provides education services, including assessment, Vocational English as a Second Language (VESL), GED preparation services and bilingual basic computer classes at the new Ford Resource and Engagement Center (FREC) at the Mexicantown Mercado in Southwest Detroit. As the lead workforce development agency for the FREC, SER also offers participants one-on-one career coaching services and job readiness workshops, as well as access to financial literacy and coaching through the Center for Working Families. SER is currently enrolling for the VESL and GED program! For more information, please contact Cristina Hancock at 313-945-5200, ext. 4332. You can also walk in at the FREC for more information, Monday-Friday 9 am- 12 pm. The FREC is located at 2826 Bagley, Detroit, MI 48216. 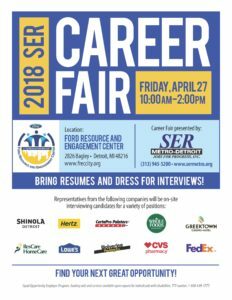 If you are interested in volunteering or supporting SER services at the FREC D1 and D2 please contact Laura Fante at lfante@sermetro.org or 313-945-5200, ext. 4269.